CEO Peter Long, CFO Paul Bowtell, Dermot Blastland, Dr. Volker Böttcher, Bart Brackx The TUI Travel board poses on their website. 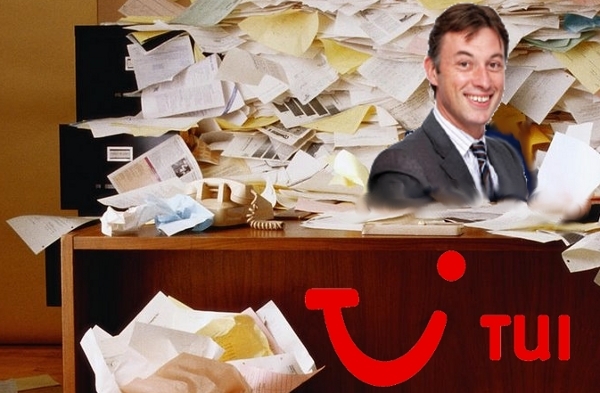 TUI Travel, the largest and most successful tour operation has apparently accepted the resignation of Chief Financial Officer Paul Bowtell. A huge shakeup occurred within the company when 2009 financials turned out to be dead wrong, and had to be restated. Shares fell sharply on the news that Bowtell (in mashup below) will leave at year’s end. Apparently, recent talks with CEO Peter Long led to Bowtell’s resignation after the company’s “bloody nose” over mixed up financial reporting. At the core of the shakeup are 117 million pounds written off from a Merger with First Choice Holidays in 2007. As it turns out, the initial 29 million pounds was nowhere near the actual loss – the additional 88 million pounds was just tacked on. Even experts have no idea who will replace Bowtell, and TUI has yet to issue a statement on this aspect. TUI Travel lost about 10 percent of its value though, in one of the biggest drops since this Summer. TUI stock has fallen 9.7 percent this year, not nearly as far as competitor Thomas Cook Group Plc, which has lost about 20 percent. With online travel gaining almost across the board, these announcements cannot be good news for agents. Meanwhile, Long & company exhibit standard PR resiliency in taking credit no matter what. The announcement of TUI leaving a small carbon footprint being among the company’s earlier reports. Taking advantage of “buzz terms” has become a part of corporate culture now, but announcing turning the copier off at night, just before 88 million pounds appear from literal nowhere? TUI should worry a bit less about the department that manages greenhouse disclosures, and ramp up their accounting team. But then, maybe that carbon footprint will need restating too? Aren't accountants supposed to count good? Another interesting point here might be the indpendent audit carried out for 2009 by KPMG Audit Plc. In their opinion TUI’s numbers were to be trusted. Was this for the same audit period? Just what kind of independent audit was this? Is this where the discrepancy was discovered? Not much is actually clear as to how this “miscalculation” occurred. One thing seems certain, in these hard financial times, accounting errors like this are nails in a company’s coffin.